Your may have considered taking Pills or changing your bedtime routine, but did you realise your diet can impact sleep too? Menopause unfortunately is a time when sleep can be badly affected: anxiety, stress, night sweats and needing to get up to go to the bathroom can all make inroads into how well you sleep. If you could pick the right foods to help you get the best sleep possible, wouldn’t you? And if you knew which foods would hinder your restful slumber, wouldn’t you avoid them? Now’s your chance to learn which foods to eat, and which to steer clear of for a good night’s sleep. We’ve all heard of warm milk’s ability to send us off to sleep but do you know why it’s true? Dairy foods contain tryptophan, which is a sleep-promoting substance. Other good sources include nuts and seeds, bananas, honey, and eggs so make sure they are plentiful in your diet. If you have insomnia, a little food in your stomach may help you sleep BUT keep the snack small. A heavy meal will tax your digestive system, can make you more prone to putting on weight, plus makes you uncomfortable and unable to get good sleep. Research shows that people who often eat these foods gain weight and their sleep cycles tend to get disrupted. Why? A heavy meal activates digestion, which can lead to nighttime trips to the bathroom and certainly won’t help you sleep. It’s no surprise that an evening cup of coffee might disrupt your sleep. Even moderate caffeine can cause sleep disturbances. But don’t forget about less obvious caffeine sources, like chocolate, cola, and tea. For better sleep, cut all caffeine from your diet 4 to 6 hours before bedtime. Is there caffeine in your medication? Over-the-counter and prescription drugs that may have caffeine in them include pain relievers, weight loss pills, diuretics, and cold medicines. These and other medications may have as much or even more caffeine than a cup of coffee. Check the label of nonprescription drugs or the prescription drug information sheet to see if your medicine interferes with sleep or can cause insomnia. Alcohol may help you fall asleep faster, but you might not sleep well, waking up often, tossing and turning, and even having headaches, night sweats and nightmares. It can help to down a glass of water for each alcoholic drink, to dilute the alcohol’s effects. But for a good night’s sleep, it’s better to avoid alcohol 4 to 6 hours before bedtime. Lying down with a full belly can make you uncomfortable, since the digestive system slows down when you sleep. It can also lead to heartburn, as can spicy cuisine. If you indulge in a heavy meal, finish it at least 4 hours before bedtime. Protein is great during the day. But not so much when you’re ready for bed. It’s harder to digest and contains the amino acid tyrosine, which promotes brain activity. So skip the high-protein snack before bedtime and opt for a small piece of cheese and some sleep-friendly carbs, like crackers. Stop fluids by 8 P.M. Staying hydrated throughout the day is great for your body, but cut it off before bed. You don’t want to have to keep getting up to go to the bathroom after you turn in. Even if it’s one of your favorite ways to unwind, smoking isn’t a good idea — night or day. Nicotine is a stimulant, with effects similar to caffeine. Avoid smoking before bedtime or if you wake up in the middle of the night. Keep trying to quit — it’s hard, but it’s worth it. Bioidentical progesterone is a relaxant so it can help to slightly increase your dose before bedtime if sleep is a problem for you. Also a good Sleep Supplement works with your cream to maximise your chances of a good night’s sleep. 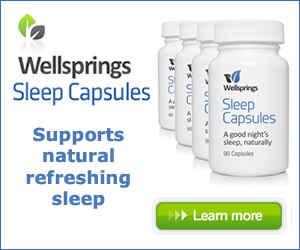 Wellsprings Sleep Capsules help you get a restful and refreshing night’s sleep with a combination of four carefully blended ingredients including L-Tryptophan, L-Theanine, Lemon Balm and Magnesium.